You may have heard that mineral oil can dry your skin out. Mineral oil is found commonly in many beauty and skin care products, generally getting a poor reputation. Here are a few facts separated from the fiction surrounding the question: is mineral oil bad for your skin? This oil is odorless and colorless and comes from petroleum, which is derived from a natural earthen substance. Though there are several grades of mineral oil, the only one used for cosmetics is the cosmetic grade quality. Petroleum must undergo a rigid purifying process removing all impurities and toxins from it to become cosmetic grade mineral oil. At the end of the process, it won’t even resemble petroleum any longer. It is safe to use. If someone is comparing it to petroleum, please understand they don’t understand the processing it undergoes. Why is mineral oil used in beauty products? Rarely are people irritated by it or allergic to it. Many doctors will even consider it the best moisturizer. It is the best of the moisturizers, although some may say shea butter is a close second. Mineral oil also provides a barrier on your skin to prevent loss of hydration. It helps to hold that moisture deep in your skin, supplying and softening it. With a little basis in fact, we can work through some of the myths surrounding is the question: is mineral oil bad for your skin? MYTH 1: Does It Clog Pores? Because of the protective barrier that mineral oil forms over your skin, it’s easy to assume that it can clog your pores. This isn’t necessarily the case. You won’t really suffocate your skin, as it perspires but doesn’t breathe. Mineral oil that is cosmetic grade doesn’t clog pores. It is industrial mineral oil that causes problems which isn’t used in cosmetics. Although cosmetic grade mineral oil isn’t comedogenic, the barrier it creates around your skin can trap comedogenics into skin, therefore causing breakouts. If you’re prone to breakouts, make sure your skincare items don’t have any comedogenic ingredients before using mineral oil. MYTH 2: Does It Stop Other Ingredients from Getting In? It’s easy to see where this thought comes from, with the protective barrier that mineral oil creates. You may think that vitamin C, retinol and all the rest of the beneficial items can’t get to your skin. But they get through. Mineral oil helps moisturize because it forms a hydrophobic barrier that only certain ingredients can get through. There have been scientific studies showing the diffusion rate of sulphathiazole in creams with mineral oil. The creams had from 8% to 83% mineral oil in them. MYTH 3: Does It Prevent Collagen from Penetrating the Skin? Is mineral oil bad for your skin? Although similar to the second myth, it deserves the explanation. Collagen is often brought up when discussing whether mineral oil forms an impenetrable barrier. It’s important to note that collagen doesn’t penetrate skin anyhow. Collagen is too large of a molecule to get through. MYTH 4: Can It Cause Cancer? This is another myth where people confuse industrial mineral oil for cosmetic grade. Industrial mineral oil has toxins in it that may be cancer causing, but this isn’t used in facial creams, only cosmetic grade mineral oil is. This form is very purified, and lacking toxins. MYTH 5: Will It Dry Your Skin Out or Age You Faster? This is perhaps the most ridiculous of the myths. Mineral oil will create a barrier on the skin, which locks moisture in. This will moisturize; the exact opposite of drying the skin out. Making skin age faster is also a claim that has no evidence to back it up. Nothing in mineral oil can make you age faster. MYTH 6: Is It Contaminated? Is mineral oil bad for your skin? No, in this case. Mineral oil is used in cosmetics globally as well as skin care products and it’s approved by the British Pharmacopeia and the USP or United States Pharmacopeia. It is free of carcinogens, impurities and compounds found in industrial grade mineral oil. When it comes to impurities, plants are even subjected to them. The ground plants grow in is subject to mold, worms, bacteria, fungus and insects. Therefore, it must be purified before it can be used for cosmetics. It is likely, you wouldn’t want the plants used if you saw and smelled them in their natural state. Then What's Bad About Mineral Oil? There is some reason to criticize mineral oil, however. It will only moisturize your skin, nothing more. If you want to have irritations soothed, or premature aging fought, you will need to use an oil such as evening primrose, rosehip or argan. Mineral oil is not a multitasking one. This does make it very good for sensitive skin. Since mineral oil is made in a sterile lab with minimal compounds, it is easier on sensitive skin. It isn’t an irritant, as some fragrant oils can be. 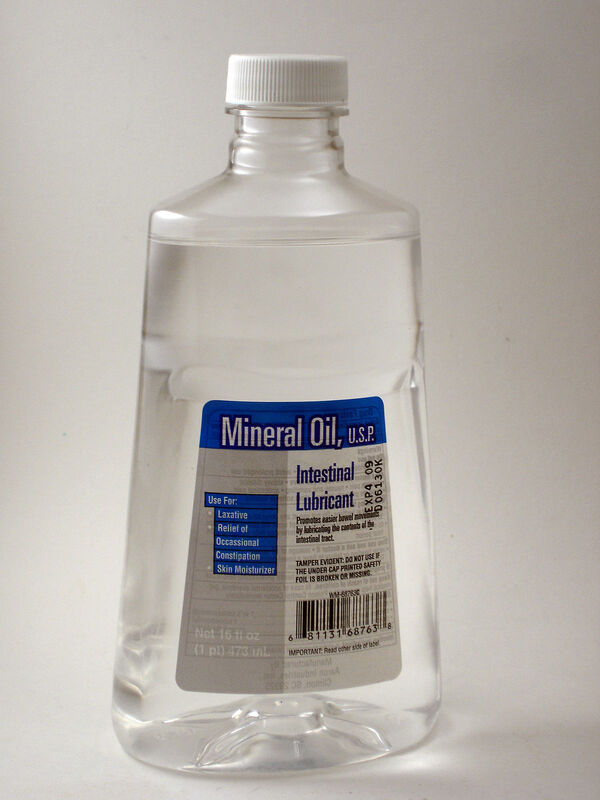 Should You Use Mineral Oil? Your skin is dry and doesn’t hold moisture. Your skin is prone to acne. You want an oil that has anti-aging properties as well as moisturizes.